Location - Not far from the train station where the KTX is accessible. Right in front of the beach and near all sorts of restaurants and shops. Checking-in - Was a breeze. Although their English was not fluent but I could understand. Understanding some Korean language made it easier for me to understand that they were giving me the option to choose the rooms. They showed me both rooms and let me decide. Excellent service. 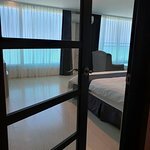 Rooms - with view of the beach, beautiful morning and night view. Room was spacious. Love that the bathroom is separated by another "main" door, which is another door to the room (see photo). Shower area was a little small though, with no separator, shower curtains would be nice. Nice lounge area in the room too, with coffee table and 2 single seater sofas. That is in addition to the study table and the coffee maker table! Really spacious room that is like a mini suite. Bed - the bed was big and comfortable with sufficient pillows. I noticed most hotels nowadays don't provide enough pillows. Facilities - coffee maker, toiletries, towels were provided. This was a very nice surprise...we booked this hotel as a walk·in off the street. The hotel is sandwiched between the sea and lake. 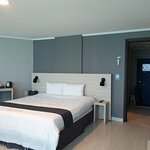 The amenities and room are new, clean and modern, our room even smelt new. 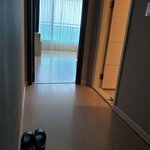 By Korean hotel standards the rooms are spacious and the bed very comfortable. View from room is amazing depending on the room you get a view of the sea , which you can watch the sunrise, or view of the lake. Hotel photos can be a little misleading, Motel is a little dated compared to the photos. I was expecting more amenities for the price. Most Motels in Seoul weekend price 70,000 Won. Friendly English speaking staff. The room was nice, excellent view of the ocean. Plenty of seafood places and coffee shops, couple of burger and pizza places if Korean seafood is not your favorite. Some very nice historical homes in the area, which I enjoyed more than the beach. Overall the Motel was decent place to sleep, extremely close to the beach, good place to crash for a night or two. The area itself I had higher expectations for a touristy area. Not very much to see or do. I would not stay in this area for more than a weekend. Room is very spacious and the bed is comfortable. The best thing is the seafront view, we sleep at night listening to the sound of the wave, which is really calming. Furniture is a little outdated but the staff is very helpful. Our bathroom light give way in the middle of the night and they just come to fix it 5 mins after we make a call to the front desk. Location is great too, beaches is just across the road, cafe and seafood restaurant fill the lane, and a lovely broadwalk is available, nearby scenery is lovely. We stayed here for 4 nights in total. Check in was quick- one of the assistants spoke English which was great for the foreigners. The room itself was on the 3rd floor. We had a private balcony. The room was basic, yet clean (which is the most important thing for me). The bathroom was a tub, with a shower. The drain did clog a bit and took some time for the water to go down. The tap from the air con was in the bathroom and the water kept leaking out onto the bathroom floor- making the floor always wet and uncomfortable to use at times. Basic bathroom amenities- they provide soap and hair shampoo and conditioner in large bottles so it isn't personalised and you don't know who used it or what they did to it before you.. so maybe take your own! 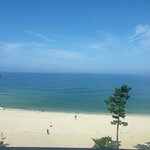 Overall a good stay, directly across the beach so you had amazing beach views! VERY convenient and easily accessible location!!! Had many restaurants, coffee shops nearby. Overall a good stay! no complaints.